This year ends some development phases. 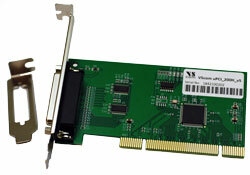 Vision Systems announces new models for PCI and PCI Express serial port cards. They become available, replacing the most popular models of the past. For synchronisation these are nick-named version 4 or v4 in short. The models with two serial ports are available already right now, four serial ports for PCI Express will reach the market in January 2019. Shortly after that followed by a model with four serial ports for PCI bus. The serial interface of RS232 is still in use on the market because of its simplicity in construction and cables, and also for its robustness in data transmission. Therefore even today on some new hardware it is the interface of choice. Further there is wide-spread use in business and especially industrial environments. Consequently computers to control the devices, sensors and machinery need addons to support this function in several ports. Since the 1990s VScom is well known for providing those interfaces on various bus systems, back then starting with ISA bus. 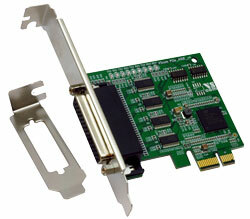 Over many years product families for PCI and also PCI Express bus have been known and are welcomed by customers. Over the years the central circuits of these models became phased out and where no longer available. Due to stock management VScom could still supply the addon cards for years after that. But eventually stocks ran empty and so the most wanted models are phased out today. While the basic configuration of each new model is for Standard Height PC cases all models are available as variant for installation in Low Profile housings. This is of special interest when constructing small size computers for use as IIoT controllers. The Low Profile option is always included as an additional front bracket for the lower cases, users just replace the standard bracket with the short item. On the functional side the serial ports provide long FIFO memory for each serial port plus on-chip automatic flow-control function to ensure reliable data transmission. Standard bitrates plus many unusual configurations support extreme hardware. Drivers are available for installation in old Windows 2000 up to modern Windows 10. For industrial users the cards also support Windows Embedded 7 and Windows 10 IoT. Current Linux installations already ship with drivers to support the serial ports.